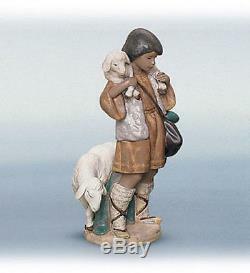 01012284 SHEPHERD BOY - part of nativity scene. Lladró borrows inspiration from the colors of the earth to create its sculptures in gres, a material whose earthy tonality and matte finish adds warmth to the pieces, and allows for a wide spectrum of colors thanks to the use of enamels. This Lladro figurine is brand new and in perfect condition. It is made in Spain and comes in the original Lladro Box. The item is of perfect quality, (we do not sell seconds). We are an authorised Lladro stockist and are one of the largest distributors in the United Kingdom. The item "LLADRO Porcelain Gres Finish SHEPHERD BOY (01012284)" is in sale since Thursday, December 14, 2017. This item is in the category "Pottery, Porcelain & Glass\Porcelain/China\Lladro/ Nao\Figures". The seller is "giftwareseller" and is located in London. This item can be shipped worldwide.